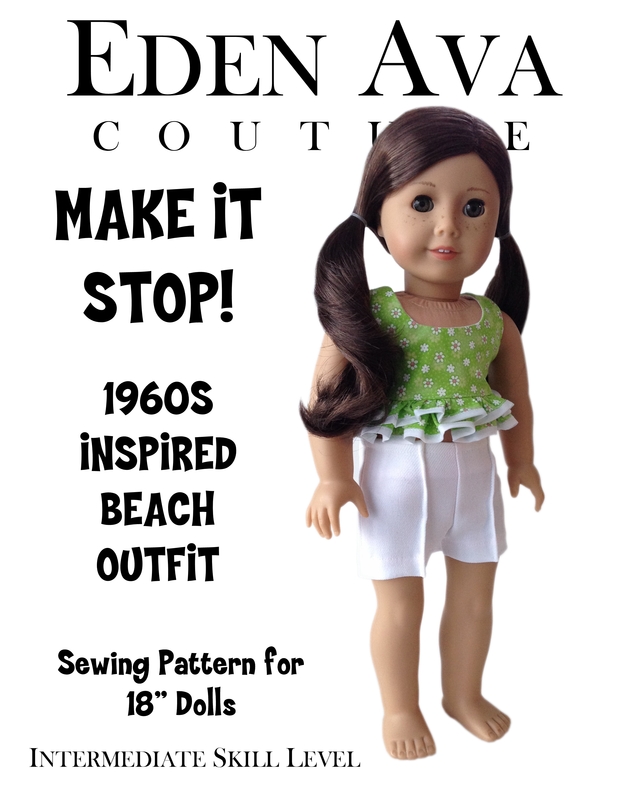 Make It Stop 1960s Inspired Beach Outfit Sewing Pattern Now Available For Purchase! Is anyone else longing for Summer? With all the snow, I thought this pattern could bring a bit of warmth to your day and get you motivated to sew for summer! The pattern is called Make It Stop! and is inspired by an outfit worn by Maia Mitchell in a scene from Disney’s Teen Beach Movie. Maia’s character can’t stop singing as she becomes stuck in the movie, Wet Side Story. The outfit features a midriff top with ruffles, trimmed in contrast bias tape. The top buttons down the back. The shorts sit at the hips and close in the back with Velcro. They feature sewn seams down the front. The pattern is intermediate skills due to the button holes, but if you choose to use Velcro or snaps, it’s very easy to construct. 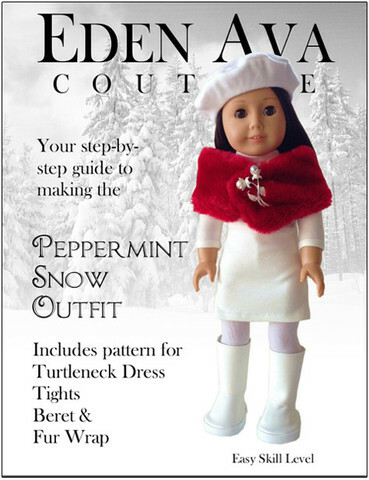 It is now for sale at Eden Ava Couture Etsy Pattern Shoppe! Download, Print, and Sew today!!! Well Christmas is over and that only means……it’s time for Downton Abbey to start its fourth season! Yahoo! I can’t wait for Sunday! In the mean time, in honor of the show, Eden Ava Couture has just released The Cloche Hat Pattern! The cloche hat is a fitted, bell-shaped hat for women that was invented in 1908 by milliner Caroline Reboux. It became very popular during the 1920s, but continued to be seen well into the 1930s. The word cloche, is derived from the French word for “bell”. This lovely lined hat pattern includes two variations, but it is made from the same pattern pieces! Download, Print, and Sew today! Frozen Hot Chocolate Pattern Mistake! A very observant customer just informed me that there is a mistake in the Frozen Hot Chocolate pattern. The pattern pieces for the skirt say to “cut 2 for lining”. This is not needed as only the bodice is lined. The sewing instructions, however, are correct. My apologies for any confusion! I will be working on correcting this! Gotta love cut and paste! Thank you so much for letting me know!!!! Just listed on Etsy is The Feisanista Irish Dance Solo Dress Set. 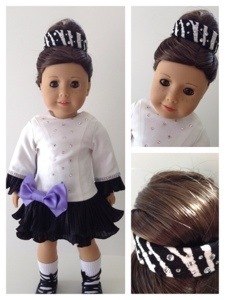 This EDEN AVA COUTURE Original One Of A Kind Irish Dance Solo Dress is designed to fit 18 Inch American Girl Dolls. Princess seam dress in white shantung has layered skirt with gathered black crinkle satin, decorated with rhinestone trim on the sleeves. A purple satin bow embellishes the dropped waist. Detachable Cape & Headband Headpiece are made with black and white velveteen cord animal print. Bloomers are the same animal print fabric and are finished with serged seams. Irish Dance Solo Dress, Cape, and Headpiece are adorned with nearly 100 Swarovski crystals! 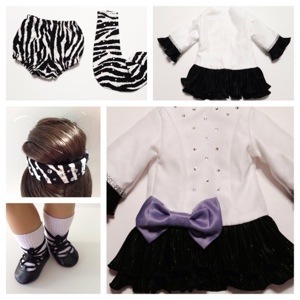 Listing includes Dress, Cape, Headpiece, Bloomers, Socks, and Ghillies. Behind The Scenes with EAC! I was recently contacted by Karen from Karen Mom of Three’s Craft Blog to do a behind the scenes interview. You can read the article HERE. It was such an honor to be contacted and asked to be featured! PIN & WIN: TEN Eden Ava Couture Patterns! Would you like to win TEN Eden Ava Couture Patterns? Go to THIS PIN and pin it between now and November 23. On November 24th, one lucky pinner will win TEN Eden Ava Couture patterns! There’s nothing more beautiful during the holidays than freshly fallen snow! Add to that a touch of red and you have the colors and freshness of Peppermint Snow! This lovely ensemble includes a turtleneck dress/shirt featuring sleeves in 3 different lengths, a beautiful fur wrap, beret and tights. The Peppermint Snow Pattern is now available at our Etsy Store.